The folk-art look to Gretel is so fun! All the little details really add up to such a sweet collection. You can do some great fussy cutting with the prints too! I can just envision a whole little group of hexies made with that large circle floral print, can’t you? 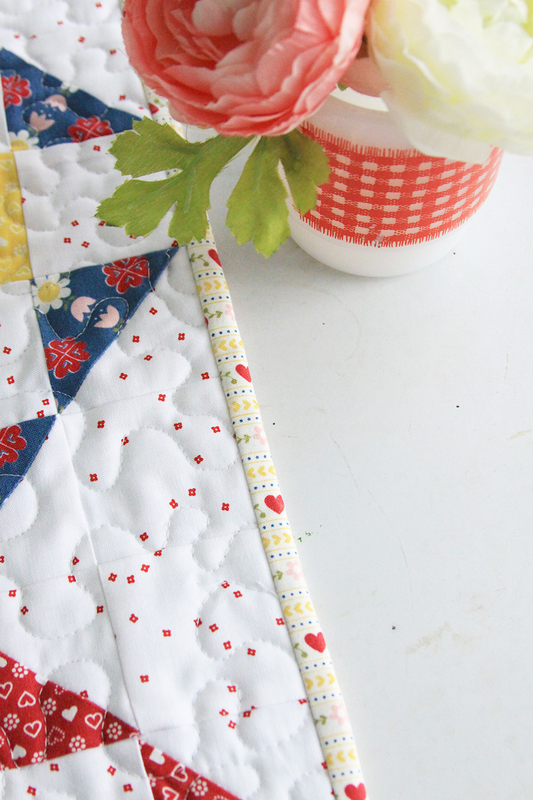 I’ve created this sweet Gretel Fabric Mini Quilt for my first project with Gretel! This is a quilt design I’m developing and I love testing a few of the blocks in a mini quilt. 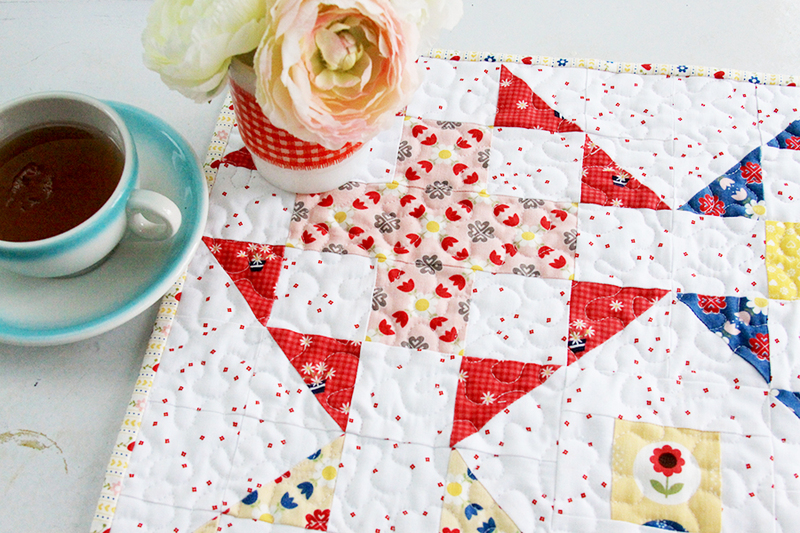 It makes for a fun way to try out the design – and I get a cute mini quilt out of it too! I have a few more Gretel projects planned too – I mean I can’t not use that little stripe in the binding as part of an embroidery hoop art project can I?! 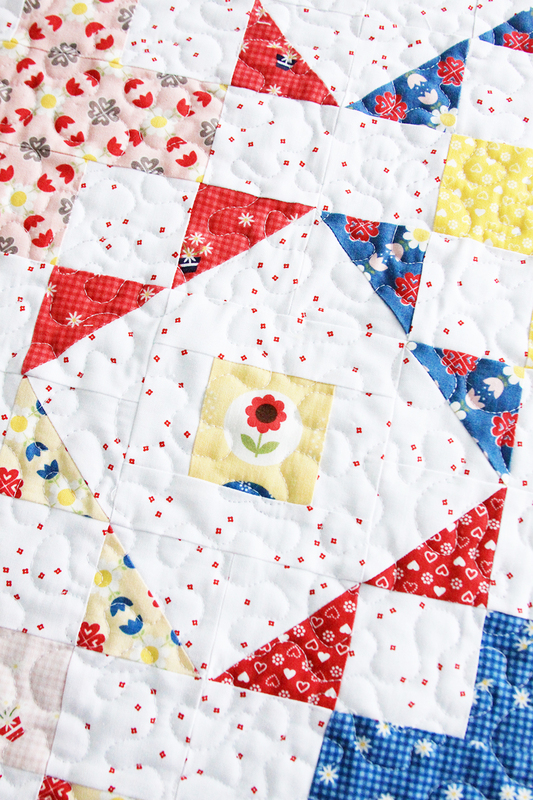 The quilt pattern is great for showing off fabrics with smaller prints just like Gretel! I even took the time to do some fussy-cutting. I love how that little flower looks in the center! I also have to do a little rejoicing for the pattern matching on that top left plus block. I may have shrieked when I saw that turn out the way I wanted to on the first time! I used Blossom from Christopher Thompson as the background in the quilt. It’s my new favorite basic and I’m a bit obsessed. I think those super tiny flowers look so darling with Gretel – don’t you? I’ll have the throw size quilt pattern out in the next month or so – but I need some help naming it! Quilt names are hard y’all. Any suggestions?? If so, leave them in the comments! If I pick yours for the quilt name I’ll send you a free copy of the pattern! 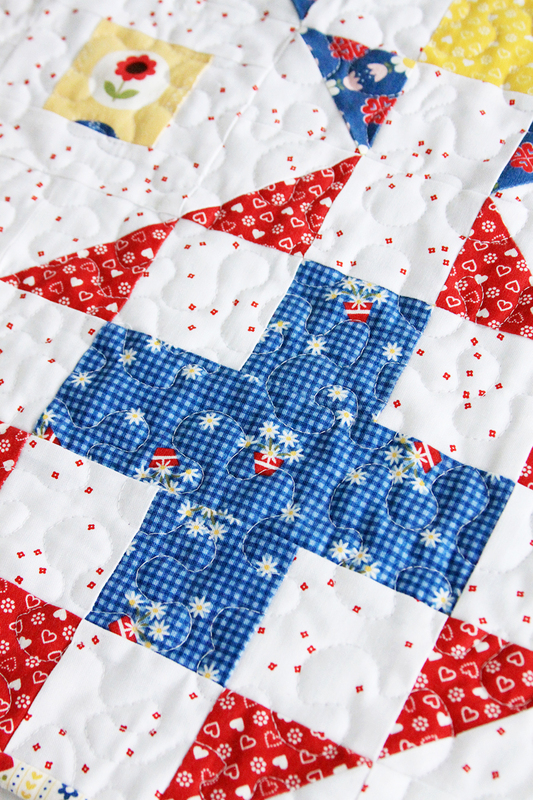 You can check out more projects and info on Gretel on Amy’s blog here: Diary of a Quilter. While you’re there look around!! 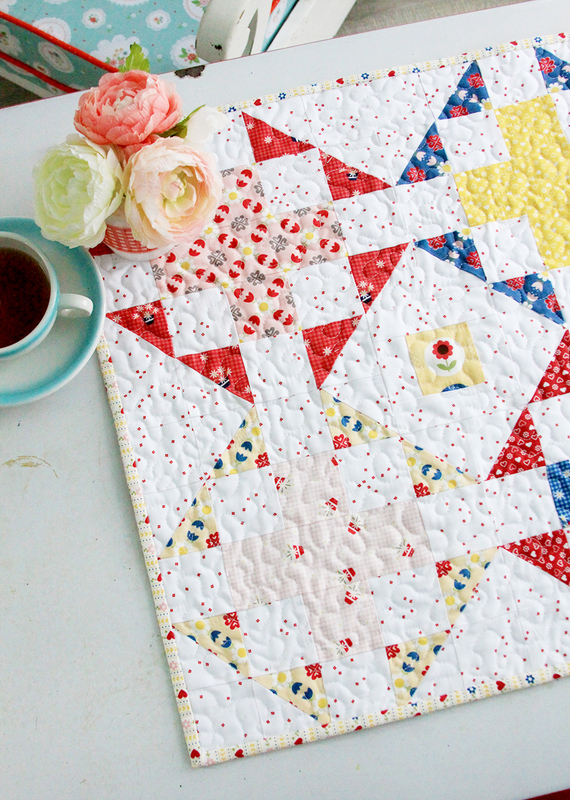 She is amazing and you’re sure to find your next quilty project there! Gretel would like nothing more than “A Walk in the Woods” for a quilt name! 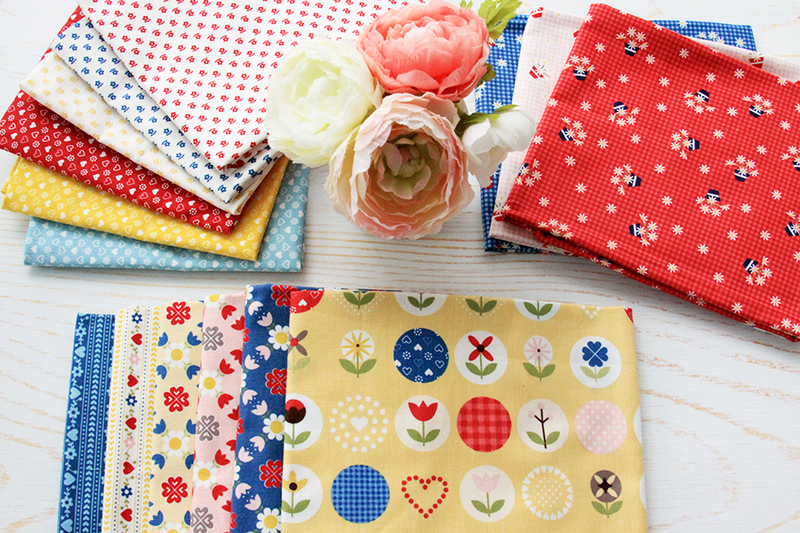 The fabric is perfect for your design and so sweet! I think Criss-Cross Applesauce would be a great name for the mini, I would love the pattern. “Hopscotch” I think that would be a good name for your mini! 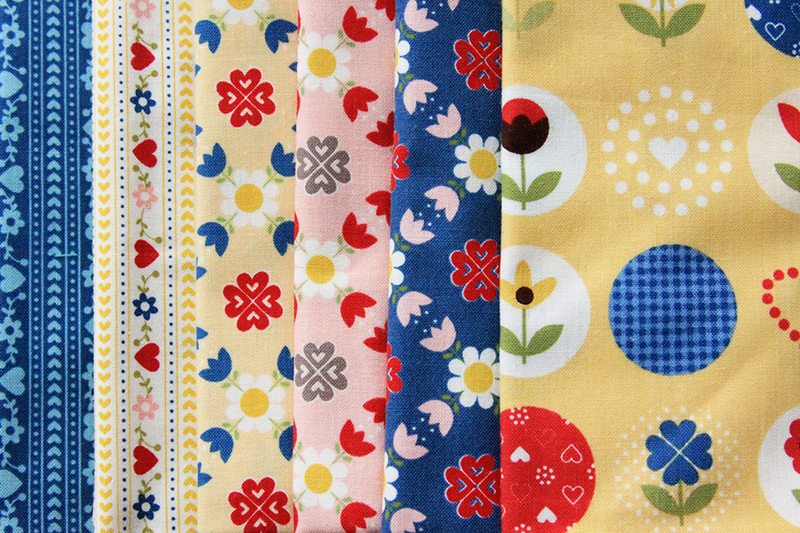 Gretel fabric and little girls playing hopscotch as we once did when we were kids…I think that sounds cute. 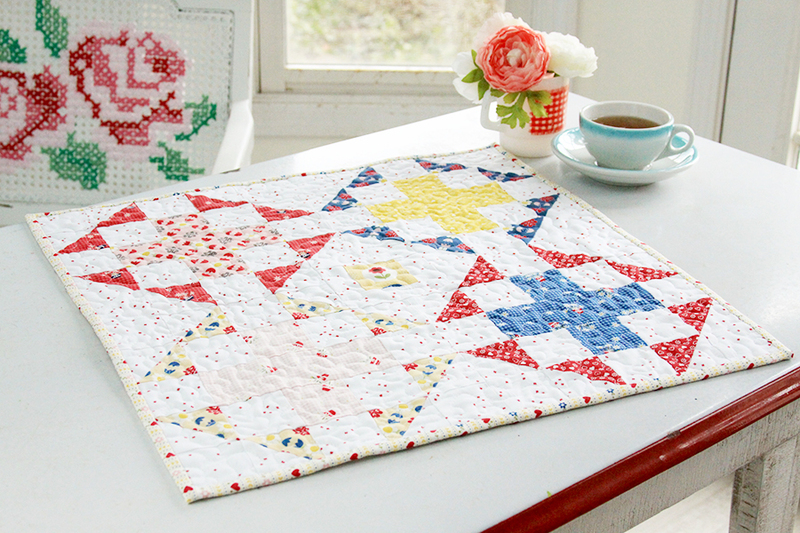 Beautiful mini quilt! 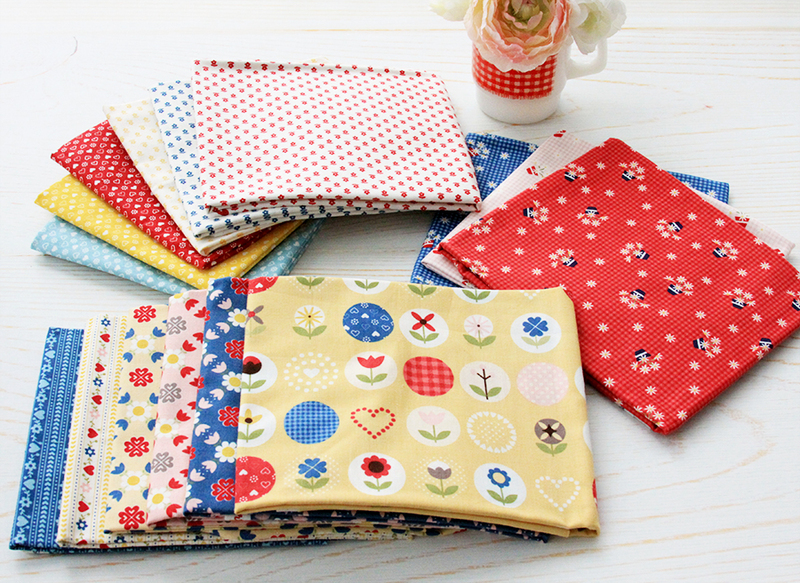 :) I just busted my stash with the Gingham Girls fabric on a quilt along with A Quilting Life. Although I’m a pink person I love the Gretel line! Thanks for sharing. I love this so much, Bev!! I saw it and love it and immediately thought Hot Cross Buns. Love this! I think it should be called Gretal Crossings ♥️. I love all your sew and quilt items you do! Nature’s Way comes to mind as a name. This is beautiful! What a lovely mini! I’ll submit “The Garden Path”. So pretty! When I saw the cross blocks and the heart prints I thought of: ‘Cross My Heart’. The fabrics in this collection are lovely. I just love it!! I think it should be called Sunshine of Love as it reminded me of both. Just Adorable! I thought of Four-Square Showcase because the four square show off the little flower in the center. It really is a beautiful line and I love how your pattern shows it off. When I saw the cross blocks and the heart prints I thought of: ‘Cross My Heart!’ These prints are lovely. Happy Hoppy Days! Love the pattern and all of your ideas! When I saw this I pictured the crosses as walls around the “Secret Garden” with the flower. Love it! 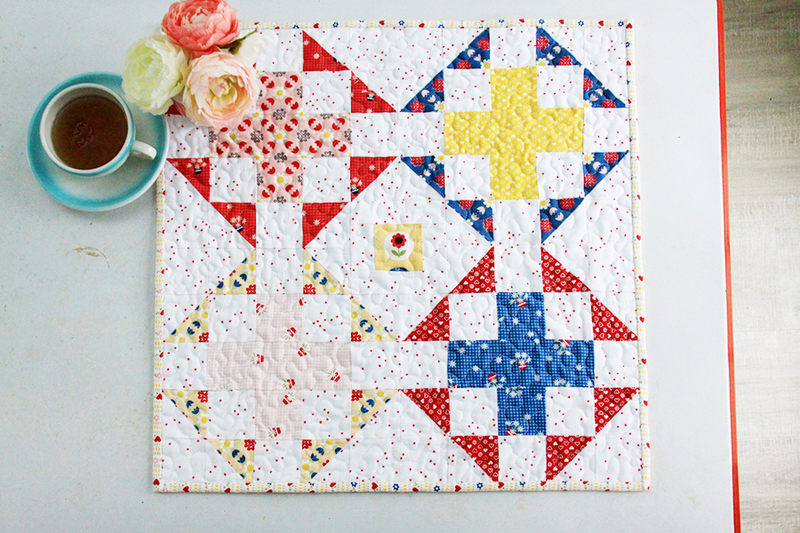 Love the fabrics and mini quilt – Spring Plus … The Plus is your choice . I love the mini quilt and fabric! Mini quilts are my favorite. How about naming it “Cross My Heart”. It is almost February!! Hansel’s Path came to my mind. Cute quilt. name? Hopscotch comes to mind. My first two thoughts were Cross My Heart and Garden Path, but see those have been mentioned. My third choice would be Garden Kisses “X”. The “x” blocks remind me of the way we write hugs and kisses on a note. Hi this is Kristina visiting from Thrifty Thursday. I have absolutely no talent in this but I love quilts and wish I did! This particular pattern really stuck out to me. It’s so bright and cheery! Beautiful! Thanks for sharing at To Grandma’s House We Go DIY, Crafts, Recipes and more Link Party. I pinned this! Hope to have you join us again next week. Love this mini, Pixi Heart! 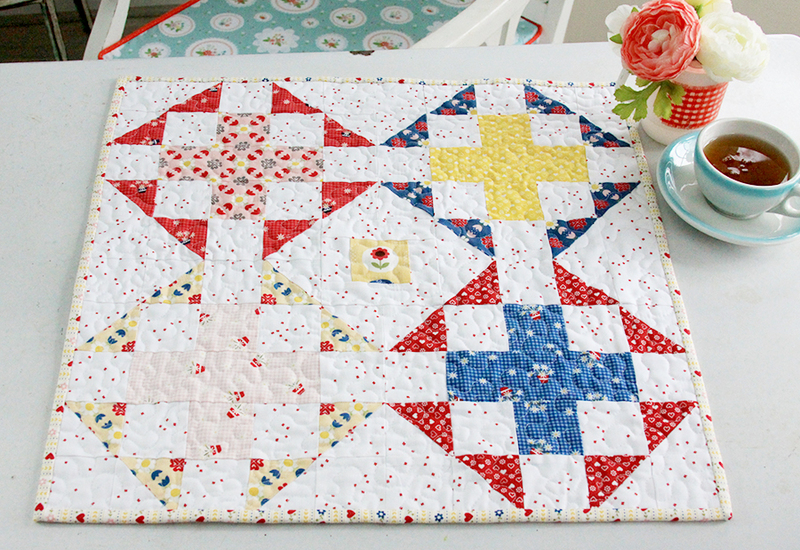 This sweet quilt reminds me of the center of an English village, so how about naming it Village Square or Village Green. 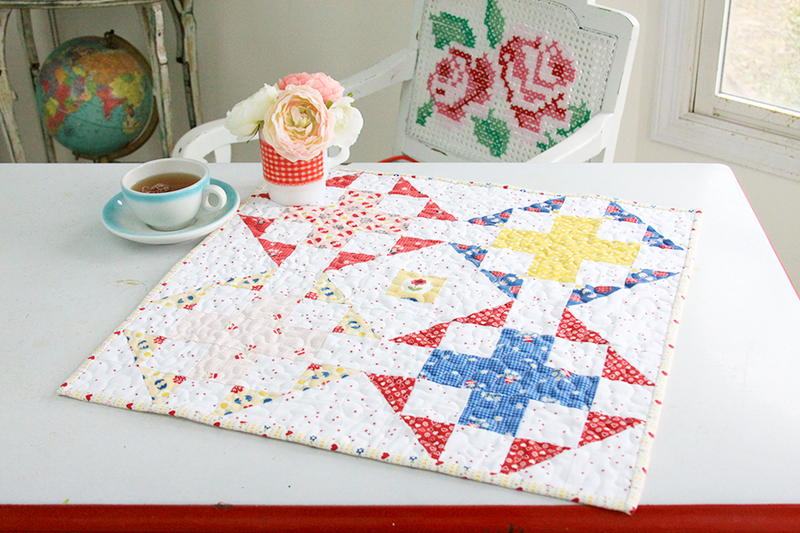 Where is the pattern for this mini quilt? Somehow, I’ve missed it. Thanks. Yes, can you obtain the pattern for this quilt? I am a new quilter and looking for this type of quilt and to purchase the fabrics, as well. I would appreciate receiving a reply. 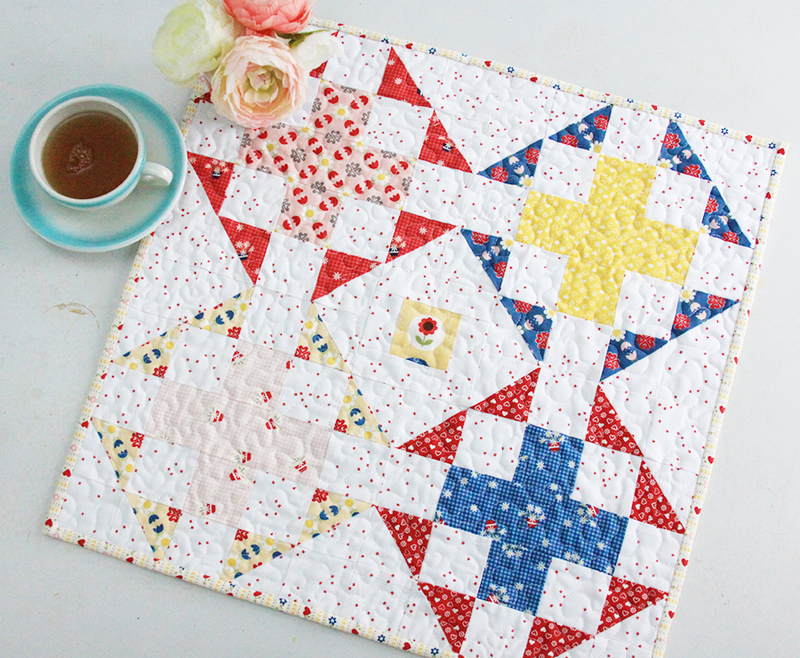 The pattern for this quilt/mini is still in production! It will probably be a month or so before it’s out. You can sign up for my emails if you’d like – I’ll announce when the pattern is out on the blog and in my email newsletter. Thanks! Thank you for the name of the pattern, but I can’t find that pattern anywhere on the Internet. Can you possibly provide a link to the pattern because I am completely missing it, somehow. Thank you. What a happy little quilt! How about Happy-Go-Lucky?